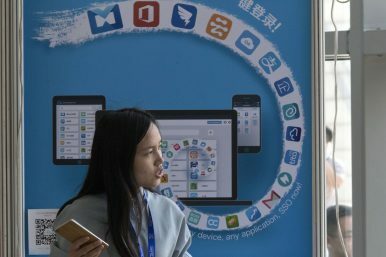 A woman stands near a booth promoting online cloud services at an exhibition in Beijing (May 19, 2016). Yes, China’s internet policy quashes dissent – but it also fosters innovation. The People’s Republic of China entered the Internet age in 1994; 23 years on, China is considered to have the largest online population worldwide, with 731 million active users. At the same time, China has one of the world’s strictest online legal frameworks. One could easily assume that an online ecosphere as vibrant and active as China’s would lead to many differentiated approaches to interpreting Chinese Internet law. Instead, China researchers, legal scholars, and observers of the Chinese internet industry have engaged in ever-repeating, entrenched, and constricted narratives focused on human rights abuses, censorship, and political oppression. Simultaneously and largely unnoticed, China has devised a strategy of innovation security as part of its internet law. The narrative of a monolithic and repressive regime in Beijing is tempting. It is an easy approach to the Chinese internet and has a long history. None of the global social media and Web 2.0 market leaders – Twitter, Facebook, YouTube – are available on the Chinese internet, and Chinese users search the web with Baidu, rather than Google. The “Great Firewall of China” is therefore a beguiling and easy to memorize catchphrase, and also somewhat accurate. However, the term is also evaluative rather than merely a description of the conditions on the Chinese internet. What lies within the confines of this “Great Firewall” is a question that remains unanswered. Clearly, the implication is that the Chinese internet user base is disconnected from the world. Undoubtedly, social media and Web 2.0 in China and the rest of the world have developed dichotomously. Outside of China, a handful of U.S. companies maintain firm control over the market. Within China, a growing number of domestic substitutes have created a market for themselves. And rather than restricting themselves to their home market, WeChat, Sina Weibo, and Youku Tudou have begun to compete for international market share. Hence, the first important realization is that the absence of Western Web 2.0 and social media online services does not mean the absence of sustainable internet enterprises within the “Great Firewall.” This realization should be followed by questioning the role of Chinese internet law in the evolution of Chinese internet giants. China has a comprehensive legal framework of internet regulation. Since the passing of the “Interim Regulations on the Management of International Networking of Computer Information” in 1996, China has enacted more than 13 statutes and regulations directly concerned with the management of the internet. A material analysis of the body of Chinese internet law indicates the positioning of platforms before content as the main regulation subject beginning sometime in the early 2000s. To fully appreciate this repositioning, one ought to revisit the fundamental difference between the Web 2.0 and pre-Web 2.0/social media eras. Before the emergence of Web 2.0, the internet was one-directional and read-only. In other words, a limited number of providers would produce content for a great number of consumers. This was also true in China, and accordingly authorities focused on controlling content. For instance, the “Decision on Safeguarding Internet Security” of 2000 mandates criminal prosecution of online activities endangering national security, undermining the position of the government, eroding national unity, and promoting religious cult organizations. Around the same time, the government also enacted the “Telecommunications Regulations” in 2000, and thereby created the Internet Content Provider (ICP) license scheme. The scheme requires content producers – generally websites – to file their information with the Ministry of Industry and Information Technology (MIIT). Offending content would ultimately lead to a revocation of the ICP license, rendering the website inaccessible from within China. A first noticeable repositioning toward the regulation of platforms was the introduction of industry self-regulation with the “Public Pledge on Self-Discipline for the Chinese Internet Industry” in 2004. At a time when social media was slowly emerging, the term Web 2.0 had just been defined, and the way in which online content was produced, shared, and consumed experienced revolutionary changes, self-regulation implied an acknowledgement that direct content management by the government could no longer effectively yield the desired effects. Such an approach becomes impractical when every user is equally and simultaneously a potential content producer. Therefore, legislation from 2004 on, such as the “Provisional Provisions for Administrating the Development of Public Information Services on Instant Messaging Tool,” primarily regulate platforms, rather than content. This is not to argue that filtering of content sensitive to the Chinese government no longer occurs, but rather that in the case of domestic platforms, government is no longer choosing a path of straight escalation toward the tip of the enforcement pyramid. Rather, authorities employ a responsive enforcement strategy of enforced self-regulation. Revisiting the absence of Western Web 2.0/social media online services, or rather their imposed inaccessibility from within China, one should explore the dichotomous regulatory treatment of foreign and domestic platforms. The Chinese government has the means in both technical infrastructure and administration to manage non-compliant domestic and foreign platforms. For example, out of the four Chinese internet backbones, CHINANET and CHINAGBM serve commercial ISPs and are under administration of the Ministry of Industry and Information Technology (MIIT). The remaining two backbones, CERNET and CSTNET, are under administration of the Ministry of Education and the Chinese Academy of Sciences, respectively. In other words, there are no private or otherwise non-state-affiliated backbones that connect China with the global internet. Given the value of the Chinese market and the Chinese government’s capacity to effectively act on non-compliant behavior by social media and Web 2.0 services, foreign platforms would likely do their utmost to manage content according to government standards in order to maintain their position in the market. Yet despite Western social media platforms reaching out to China and signalling willingness to comply – Mark Zuckerberg of Facebook being a prime example – there appears to be no change in the enforcement strategy followed by China’s government. China’s technical and administrative regulatory tools are equally effective in dealing with non-compliant foreign and domestic platforms, but foreign and local services are still treated entirely differently. This is the second important realization concerning the nature of Chinese Internet law, and it points to a motive beyond censorship. Understanding the motivations beneath this observation requires a contextual examination of the internet in general, as well as the internet in China in particular. When China entered the World Wide Web in 1994, the United States – arguably the center of technological innovation on the internet – already had 30 years of online experience. What started out as a U.S. defense network called “ARPANET” during the Cold War came to fuel an entire industry. In other words, Silicon Valley, the long undisputed global hub of innovation, owes its position to the profound influence of U.S. government policy on the evolution of the internet. On the cultural front, the influence of Western online content on Chinese society has always been subject of domestic criticism. In this very specific context, Chinese politicians and scholars have defined a concept that has almost not resounded with Western academia: the notion of “cultural security” (文化安全) refers to the “protection of the basic societal structure, national language, history, intellectual tradition, indigenous knowledge, and religious beliefs from erosion, destruction, and subversion by internal and external hostile forces” as defined by Shi Zhongying of Beijing Normal University. The internet has a central position in today’s economy, and has played an active role in China’s economic transformation and engagement with the world. Consequently, the internet is seen as an enabler of economic development by the Chinese. On the other hand, throughout its 5,000 year history, China has experienced its share of unhappy exchanges with the world, particularly early occurrences of globalized trade. Considering the traumatic humiliation of China during the unequal treaties period at the turn of the 19th century, a certain uneasiness about unbound cross-border exchanges is understandable. Thus, since the early days of its Reform and Opening under Deng Xiaoping in the 1980s, China has maintained the principle that foreign investors are only welcome as long as their presence benefits the Chinese economy and large cohorts of Chinese society. The internet is not immune to this principle. The essentially closed-off Chinese market has incubated a plethora of sustainable, highly innovative domestic Web 2.0/social media platforms. Yet at first, Facebook, Google, and Twitter were just as optimistic as the Western enterprises that arrived in China in the 1980s with the expectation of selling Coca Cola and IBM personal computers to the most populous market in the world. However, the Chinese government was not willing to allow China to merely become an import-reliant consumer market without long-term benefits for its citizens. The similarities to today’s internet industries in China are striking. As social media/Web 2.0 and the technologies and business models which evolved from them take on an ever-growing role in our lives, there is no benefit Chinese society in a developmental, intellectual, technical, and economic reliance on foreign platforms. The inability of the vast majority of developed world economies to counter “Silicon Valley hegemony” is a constant warning to China. Following the concept of cultural security, “innovation security” (創新安全) refers to the “protection of an environment in which society is able to make the required intellectual efforts to achieve substantial innovation and in parallel a national economy that is able to sustain commercial applications of such innovation from erosion and destruction by internal and external hostile forces.” This concept finds its practical expression in the rise of Alibaba, Tencent (QQ, WeChat), Youku Tudou, and other successful Chinese platforms. The implications of China’s innovation security for Silicon Valley and the Western world overall are far-reaching. Not long ago, the United States West Coast was the embodiment of innovation. Now, China is plowing ahead. Just this month, Alibaba has vowed to invest $15 billion into its R&D programs over the next three years. Domestic Chinese platforms, enabled by innovation security, are no longer poor substitutes for U.S. market leaders. To name one example, Chinese third party mobile payment services Alipay and WeChat Pay are successfully entering overseas markets. In view of the large domestic user base and growing overseas adoption, the ramifications for established financial service industries in Western countries are immense. Thanks to China’s innovation security, defended by the Great Firewall, the government provides a protected environment for domestic innovators and start-ups. Human rights, freedom of expression, open debate, and democracy are fundamental values in Western societies and their realization is a great achievement. Yet someone who sees China only as an authoritarian regime will inevitably come to the conclusion that Chinese internet law only serves to safeguard the position of the Communist Party. However, examining Chinese internet law and policy from this ossified and constricted perspective merely confirms established narratives about social and political conditions in China and does not allow us to understand Chinese economic policy and strategy — or the rise of Chinese internet innovation. Jan Fell is studying at the Graduate Institute of China Studies, Division of Politics and Society, Tamkang University, Taiwan and the Global MBA Program, College of Management, National Chiao Tung University, Taiwan.